Dating back to 1908 and serving both Reykjavík and Keflavík, Reykjanesviti is the oldest lighthouse in Iceland — and at only one kilometer, the distance from Gunnuhver Hot Springs near Möðruvallavegur is short enough that one can walk between the two places instead of drive. Looming on Bæjarfell hill over the landscape of the Reykjanes peninsula, Reykjanesviti is constructed out of concrete; but it still maintains the appearance of a more traditional lighthouse. …but by 1905, earthquakes and surf had damaged Valahnúkur to the point of the lighthouse possibly falling into the sea one day. The ruins which are seen in the above photograph are all which currently remains of that original lighthouse. Once the new lighthouse — which is the current one — was built, the original one was demolished by explosion on Thursday, April 16, 1908. 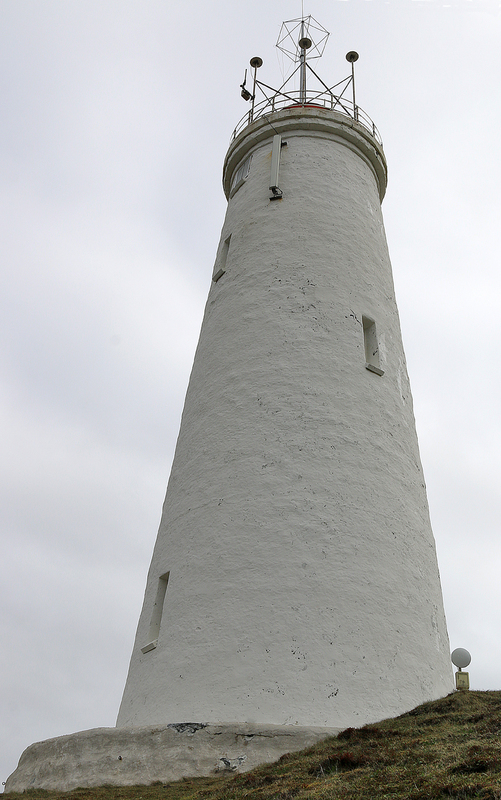 The focal plane of the lighthouse measures 73 meters above sea level. The tower is 31 meters — or 102 feet — tall and located on the southwestern part of Reykjanes peninsula. Climb up Bæjarfell hill to the top where the base of the lighthouse is located; and you are treated to an incredible view of Gunnuhver Hot Springs and the roads below. One also is treated to a spectacular view of Valahnúkamöl cliffs, which will be covered in a future article. My rental car is one of only two in the entire parking lot. The residence of the keeper of the lighthouse — which is two stories tall — was built more recently; and the lighthouse has a resident keeper, who has a sweeping view of the Atlantic Ocean. The door to the lighthouse was locked when I visited; and I found no evidence at the time this article was written that it is ever open to the public; but you are welcome to visit its exterior any time you like. There are no facilities and no admission fee to enjoy Reykjanesviti, where you can stay as long as you like. Thanks for the Iceland posts, Brian. I’m wondering if you remember if there are arrival/customs forms that need to be filled out upon arrival? No forms were needed to be completed to visit Iceland, tiffany. In fact, the entire customs process was so fast and easy that I was too early for the time I estimated to rent a car and had to wait. Great minds do think, tiffany. I smiled when I read your comment. Thank you. I hope that you had a great time in Canada; and that you have a safe, fun and exciting trip in Iceland. Are there any questions you have about Iceland? I have many more articles to write about Iceland; so what you would like me to write about which may help you with your trip?